Statement of Objectives: Clean Air Revival, Inc. Burning Issues is a project of Clean Air Revival, Inc., a 501C-3 non profit educational organization. Clean Air Revival, Inc. is registered with the Registry of Charitable Trusts in the State of California. Our organization number is #1686895. Burning Issues has an international membership and was founded by Mary J. Rozenberg, Clem Wang, Keith and Linda Bissell and Rick Barth at the Loma Prieta Chapter of the Sierra Club Clean Air Committee in 1987. In 1989 we joined with Clean Air Revival Inc. to give this project a permanent home. We are devoted to the improvement of ambient air quality through the reduction of Fine Particulate Pollution, i. e., solid particulate matter less than 2.5 microns in diameter. We need volunteers to attend Sierra Club meetings to keep the interest at the local level. The most common sources of deadly Fine Particulate Pollution are residential wood burning (RWB), restaurant wood burning, coal burning, forest fires and agriculture burning, and diesel and auto exhaust. The extent of the severity of the fine particulate problem can be grasped in the estimate that 72,000 people die annually in the United States from the effects of these fine particles. Once emitted they are impossible to clean up. More than half of the fine particulate is caused by fewer than 10% of the population using the dirtiest fuels for recreation and heating. The principal activity of Burning Issues is public education including the collection and dissemination of the latest science information regarding health effects, economic impacts, and individual actions to reduce and stop solid fuel combustion. Burning Issues also actively does particulate monitoring and has published the results. Additionally, the Clean Air Revival has been published in the New York Times, The Los Angeles Times, The San Jose Mercury News, San Jose METRO, The Globe and Mail (Canada), and many other local newspapers throughout the continent. 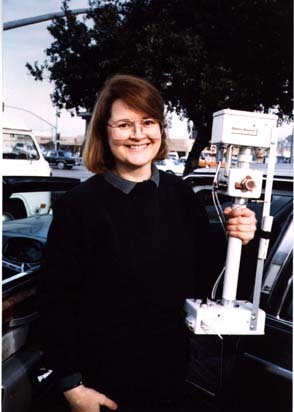 Mary Rozenberg, President, PO Box 1045, Point Arena, CA 95468, e-mail = Photo of Mary holding a nephelometer, the instrument for reading particulate levels. The asterisk (*) indicates a paid advertisement. We have no control over the content of the advertisement.